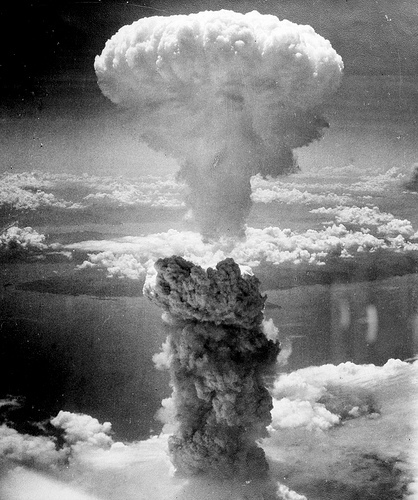 A few weeks ago, the Ask Pastor John podcast posted a link called Lust: More Dangerous Than Nuclear Holocaust. He bases this statement on 1 Thessalonians 4:1-8. In this passage, it talks about God as a punisher of those who commit sexual sins. Nuclear holocaust “only” kills bodies, so no big deal. Piper’s God wipes out whole nations of people, so apparently that’s of no concern. But lust will send you to hell, therefore it’s all of the bad. So yes, we absolutely need to spend time making sure that people who commit sexual sin get piled on extra hard. Otherwise we don’t care about their eternal salvation, because clearly they already don’t care about it. Perhaps because I’ve succumbed to lust I don’t get to have an opinion about this, but I am going to go ahead and say that I disagree with John Piper. Pretty strongly, even. 1. This makes a pretty strong assumption that Avenger God works only in the eternal. But the truth is, when I had an affair, what I felt from God wasn’t anger, but rather a loving embrace. That didn’t mean that there were no consequences, and perhaps that could be interpreted as a kind of punishment. There has certainly been guilt that has come up, but I would suggest that most of that is related to reading or listening to statements like this that put an affair on equal footing with, or even worse than mass genocide. 2. Getting into the business of others is specifically mentioned a mere three verses later. In verses 11 and 12 of the same chapter, Paul writes, “that you also aspire to lead a quiet life, to mind your own business, and to work with your own hands, as we commanded you, that you may walk properly toward those who are outside, and that you may lack nothing.” The very passage Piper uses as a reason to explain why it’s important to talk about the sexual proclivities of others almost immediately says that people shouldn’t talk about the sexual proclivities of others. 3. It diminishes the value of human life. When we treat genocide in such a flippant manner, we ignore the beauty of the lives lost, and the agony of those who are left. And while I do agree that we should not fear those who can kill the body, I don’t think that lack of fear automatically translates into lack of action. The scripture speaks to the importance of doing justice numerous times, so to speak of that desire as though it was no real Christian would pursue, strikes me as missing at least a part of Jesus’s comment that loving our neighbors as ourselves is part of the greatest commandment. I think any time we try to rank sins, we’re going to start picking things that seem most vile to us, and there’s a good chance we’re going to say something that just is monstrously stupid. And when we say something monstrously stupid like that, there’s a good chance that we’re going to inhibit those who need grace and forgiveness from having access to those things because we have created a hell of shame so great that they will never seek it. This entry was posted in Faith and Doubt and tagged adultery, John Piper, LGBTQ, lust, nuclear holocaust. Bookmark the permalink. Pingback: Bloggerhood Etc. 9/22/2014 | Fatherhood Etc.